Oil leak probably a combination of front crank seal, rear crank seal and cam seals looking at the location of the oil on the front sump lip, sides and bell housing. I do know the cam cover seals are sweating, especially the N/S one. I'm going to clean the oil off and see if it is leaking from anywhere specific underneath. It's doesn't seem too dramatic - yet! If crank seal will change when I get round to doing belt. The rear one will require you to separate the gearbox. Usually if you have oil dripping from those two bolts it's the rear crank seal. Not that difficult a job if your physically fit. Always easier with a second pair of hands though. Physically fit ahem! Actually not bad just a lazy git lol. I did change the gbox on my mk2 granada myself on the deck so should be able this no problem. That'll be a job for later. 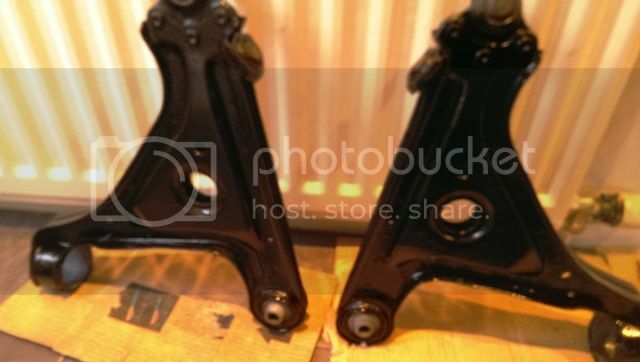 Both front arms cleaned and painted with zinc 182 then halfords gloss black paint; waiting for that to dry. New rear bushes in place, just the polys to put in tomorrow and stick em back on. And being an auto, the box is bastid heavy. Grannie was auto lump too, jack and a block of wood under sump, up it went with a hastily shoved 13mm bellhousing bolt to get it held in place. Fifteen minutes till I was saying F*&* sake! Wishbones cleaned down of rust and dirt and rust treat, painted with zinc 182 and then black gloss paint ready for poly bushes and slam dunk them back in. Good job! I did it last summer on my Caravan. I used new wishbones, removed the painting and did it new. Base was a 2K epoxy zinc primer, designed for boat coating in salt water. This is normally not available here deep down southwest, a friend sent it to me from the northern coast. I see your logic as the paint on the new ones is never that good, just a flash of black paint, they just rust away within a year or so. So ventured out and got the wishbones back on today with new polybushes. Bit of a faff getting the arm in at first. Realised I had to take off the roll bar link pin on both side and push the bar up out the way. Luckily the links came off easlil as I think they've been replaced recently so were seized up. The other bits that were a pain were relocating the nut back in the subframe for back bolt. Passenger side seems more confined to get at. After tightening up the bolt, the socket seemed to get stuck on the nut in the subframe and I couldn't get it off for a while. Luckily there is an access hole in the side of subframe I could see the socket through so whacked it a few times with a screwdriver hammer combo and it loosened it off the nut enough for me to "octupus" my arm in and round the sub to lift it out. Next bit giving me grief was getting the ball joint back in under the steering knuckle. I utilised the strong bar through the hole in the arm and levered it down as far as I could until it hit out on the subframe. At this point there seemed to be still a couple of mils still to go but putting the balljoint stub at an angle was just enough to catch under the end of the knuckle with some brute force pushing down on leverage bar for the wishbone. I then had to quite violently shove the knuckle forward so it popped into place. This has to be done with the steering in straight ahead position. It won't work at an angle. When I was putting the WB back in I devised a way to hold the strut back out of the way so I could feed in the WB easily. 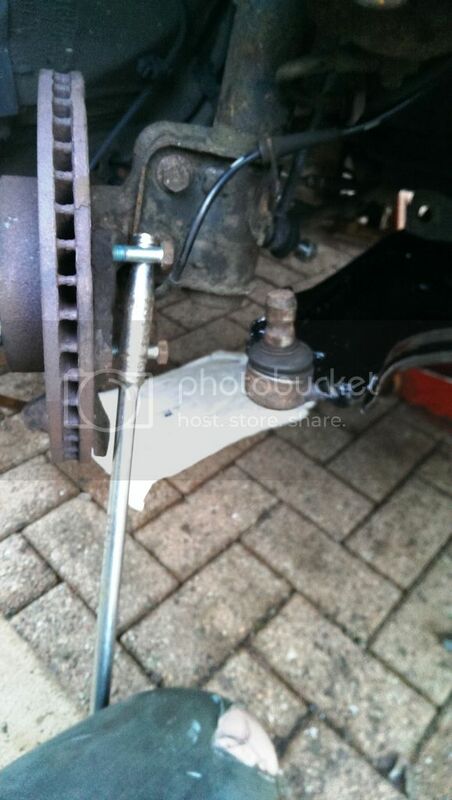 As you can see from the pic below I put a strong bar in between the brake caliper bolts, shoved it back out the way and then held strong bar in place with the side of my leg. P.S, this only works if you have thighs that will crack walnuts! Now from looking at the wheels they do appear to be a little less tilted in at the top although measuring with the spirit level and gap difference between top and bottom of wheel still seems much the same. I didn't think the bushes would make much difference here as it looks like the camber does need significant mechanical adjustment still. While I had it up on stilts also cleaned off the sump of oil and around that area. Had a look at the exhaust as well as it is blowing forom back end and the front sections look well past it too. Looks like will need a whole new system in the not too distant. Back section has been extensively cowboyed up with some sort of metal wire and exhaust repair tape or whatever it is. The wishbone rear bolts really should be fitted so that they hang down through the subframe, not be pushed upwards. Which is easier than trying to fit the nuts on the top. Fitting the struts back onto the balljoints requires a good heave on the wishbones: I wedge the jackhandle in there and sit on it to leave both hands free to wrestle the strut into place. I will be doing this job on mine later, as I've got new springs to fit. One of the reasons to change everything in one go is that it is much easier to fit the wishbones, then the hub carrier, then hang the strut from its top bolt and finally fit the camber bolts.